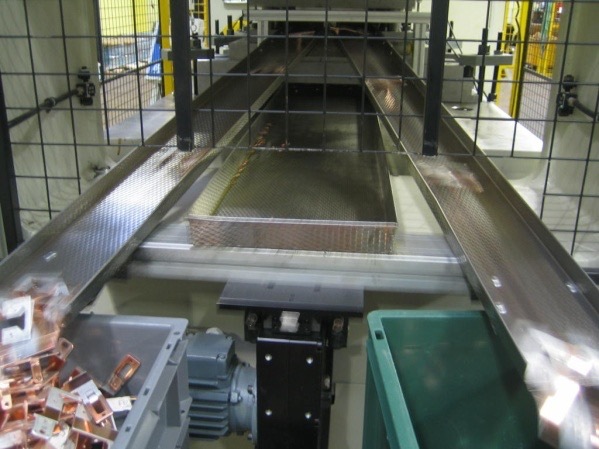 When engineers at Samuel Taylor Ltd in Redditch were looking for a conveyor to transport the scrap from under a progression tool in one direction and the components in the opposite direction, they chose the Premitec scrap shaker. Scrap shakers are a vast improvement for the removal from under press tools has always been a problem. The tool designers main objective is to manufacture a part in as few a steps as possible, in as smaller space as possible. Positioning the single tray scrap shaker at one end of the press, the scrap tray pushes the scrap under the press tool to the far end of the press bed and into a waiting scrap bin. 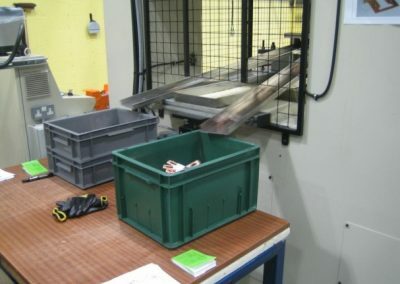 Two component trays were then positioned at a higher level on the tool to take the components and as they were at an incline, the components were able to be transported via the vibration and gravity in the opposite direction into waiting boxes. Due to its compact design, the Vibratory Scrap Shaker may be installed in confined, congested areas. Unlike many other transporters, shuttles or traditional belt conveyors, the Vibratory Scrap Shaker does not need to be located in close proximity to the tool or the cutting/press work. The scrap removal trays can be located close to the ‘action’ but the Vibratory Conveyor power unit can be a safe distance away. As in this case the scrap shaker motor and gearbox are mounted outside the press frame and the scrap trays runs the length of the press bed taking scrap away. 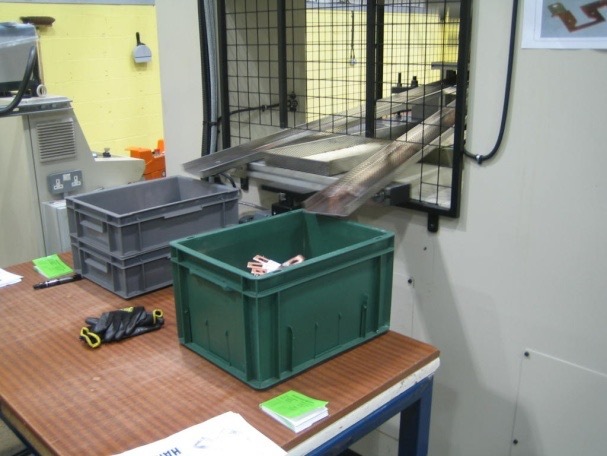 There is no limit to what can be achieved with the scrap shaker trays, as long as they do not exceed 50 kg in weight.